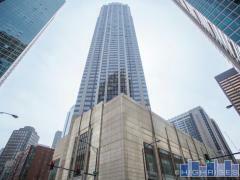 600 N Lake Shore is a newer construction doorman building with great outdoor living spaces. Assessment includes individually-controlled HVAC, gas, water, basic cable. Amenities at 600 include a modern fitness center, two sun decks, two party rooms, business center and media lounge. Parking is available for purchase. Have any comments or questions about 600 North Lake Shore? Ask your question and/or share your thoughts about this Building.